Known locally as Limestone Hill and later called the "Steel Plant District," Lackawanna, was formed from the westernmost part of the town of West Seneca in 1909. The new city derived its name from the Lackawanna Steel Company that had moved from Scranton, Pennsylvania, at the beginning of the 20th Century. An industrial future would burn brightly for several decades, and charitable institutions begun by the Roman Catholic Church prospered under the guidance of a humble man known as "the Padre of the Poor," Rev. Nelson H. Baker. His work outlasted the great steel-making plant, but both charity and industry would make the "Steel City" known worldwide. The term "melting pot" characterized Lackawanna, for its steel industry lured a tremendous workforce composed of various nationalities, ethnic groups, races, and creeds, all striving for the American Dream. 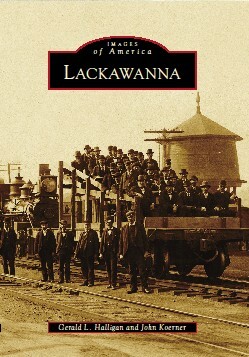 Lackawanna is co-authored by Gerald L. Halligan and John Koerner.